Our work over the last 16 years has provided us with a wealth of experiences across 29 states and includes recognitions by the US Department of Education and by Smart Business magazine for our innovative practices. Included in any successful business plan is the documented successes. We provide for you here a sample of some of our more memorable accomplishments. What does PAST Foundation Do? 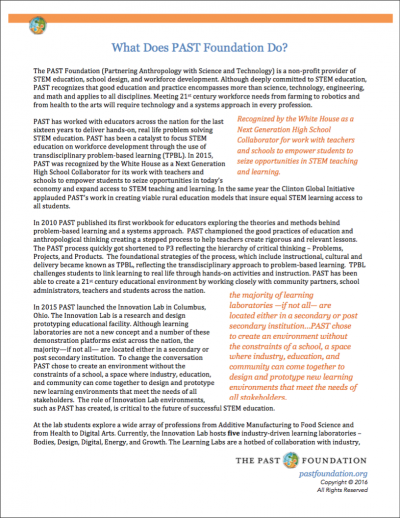 The PAST Foundation (Partnering Anthropology with Science and Technology) is a non-profit provider of STEM education, school design, and workforce development. Although deeply committed to STEM education, PAST recognizes that good education and practice encompasses more than science, technology, engineering, and math and applies to all disciplines. Meeting 21st century workforce needs from farming to robotics and from health to the arts will require technology and a systems approach in every profession. 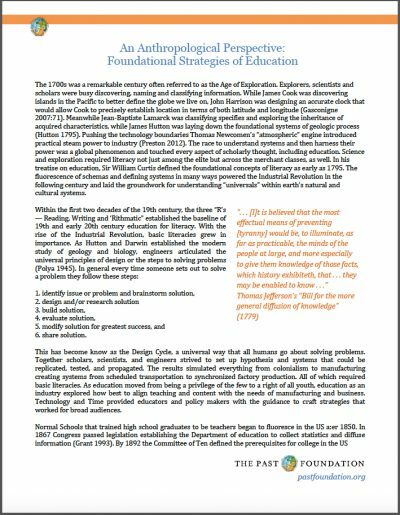 Today’s communities must examine the particulars of instruction and delivery so that they are aligned with how industries and networks function in the 21st century. As teachers shift to being guides in instruction and learning environments become portals of knowledge exploration that combine experience and authentic problem-solving, the particulars of instructional and delivery strategies will align with the cultural strategies defining literacy. 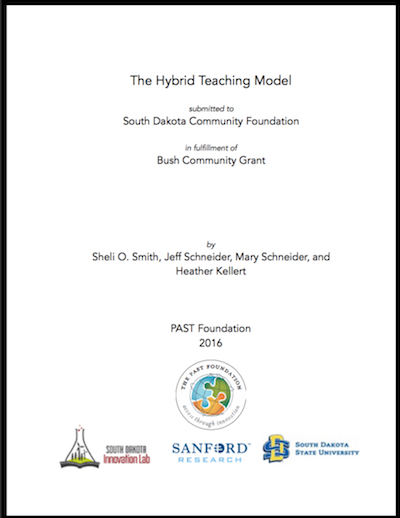 In 2015, South Dakota Innovation Lab (SDIL) was awarded a Bush South Dakota Community Foundation grant for the purpose of piloting a Hybrid teaching system that incorporates technology and prototypes a model for integrating content and problem-based instructional strategies alongside hybrid delivery for pre-service teachers. The proposal comes from a five year quest to address several critical issues facing education in rural America. In 2009 Paul Lockhart declared that mathematics is a form of art. He argues that mathematics as rote procedures and contrived applications destroys the natural curiosity of children. Mathematics as a memorization game, diminishes the inherent beauty in mathematics, and completely overlooks the fact that mathematics is a form of art. We agree with Lockhart and push the argument one step further: beyond being a game, beyond being an art form, mathematics is one of only five non verbal languages. Mathematics like Music, American Sign Language, Morse Code, and Signaling use symbols arranged in varying sequences to convey information. All are taught in formal education courses. 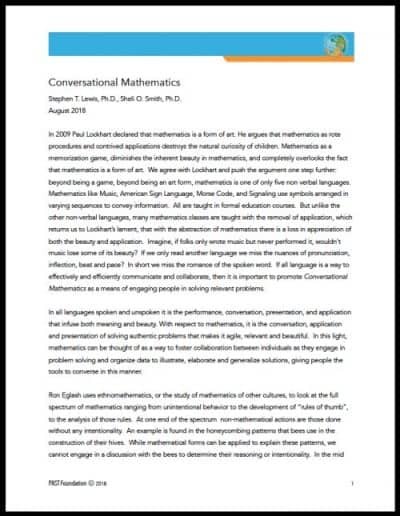 But unlike the other non-verbal languages, many mathematics classes are taught with the removal of application, which returns us to Lockhart’s lament, that with the abstraction of mathematics there is a loss in appreciation of both the beauty and application. 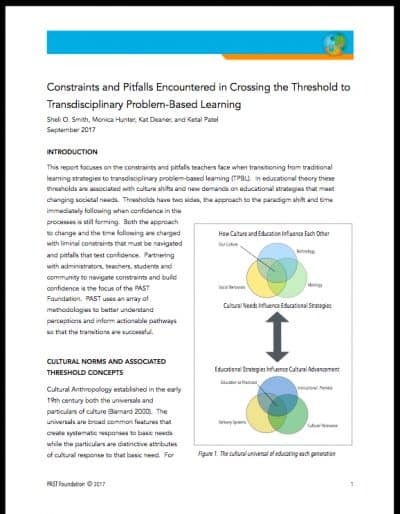 This report focuses on the constraints and pitfalls teachers face when transitioning from traditional learning strategies to transdisciplinary problem-based learning (TPBL). In educational theory these thresholds are associated with culture shifts and new demands on educational strategies that meet changing societal needs. Both the approach to change and the time following are charged with liminal constraints that must be navigated and pitfalls that test confidence. Partnering with administrators, teachers, students and community to navigate constraints and build confidence is the focus of the PAST Foundation. PAST uses an array of methodologies to better understand perceptions and inform actionable pathways so that the transitions are successful.